Public Profiler World Names: this website lets you discover how common your surname is around the world. Type in your surname and the website generates a world map to show how popular your name is. It's also possible to zoom in and have a look at regional variations. Keep an eye on the actual `numbers' as the colour coding on the maps can mask a great variety in the actual numbers. A fascinating website and easy to see how it could lead to some fascinating geography and history for that matter. 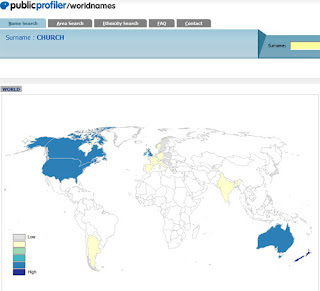 For example, why is there a higher frequency of people per million with the name Church in New Zealand than in the UK? Why are there Hamblen's in the USA and not in Canada? This site is worth a look.